The book opens in early September 1951 with Mary Gaudron as an eight year, listening to Doc Evatt, the leader of the ALP as he addressed railway union members and their families from the back of a ute in Jellicoe Park . He was exhorting them to vote ‘no’ in the upcoming referendum on banning the Communist Party. She was curious about the repeated references to ‘the Constitution’. She put up her hand “Please, Sir, what’s a constitution?” “You can write to me, Dr. H. V. Evatt, Parliament House, Canberra, and I will send you one”. He did. Mary Gaudron was known as a ‘Labor lawyer’. She served on the Conciliation and Arbitration Commission; she was Solicitor General in the Wran government; she was appointed by a Labor Government to the High Court of Australia. Yet, as Burton points out, she decided case by case, and left the political consequences for others (p. 211). A child of the railway camp at Moree, she grew up amongst Aboriginal children in the hot, dusty outback NSW town that was later notorious for its policy over banning Aboriginal children from the local pool. She attended the local Catholic primary school and won a scholarship to board at St. Ursula’s Armidale. From there to Sydney University where she won the University Medal. She married during her third year but as a married woman, was forced to leave her part-time job at the Crown Solicitors office. She was nine months pregnant when she sat her fourth year exams, and was the only part-time student to pass. She was admitted to the bar in 1968. As a barrister, she specialized in industrial law, defamation and negligence cases, and was the first woman to appear on behalf of the Commonwealth in a national wage case to put the case for equal pay. In 1974 she was appointed to the Conciliation and Arbitration Commission, the youngest person to be appointed to the rank of federal judge. She left the commission in 1980 in protest at the treatment of a colleague, Mr Justice Staples. In February 1981 she became solicitor-general during the Wran government in the midst of all the muck swirling around Chief Magistrate Murray Farquhar, Morgan Ryan, Clarrie Briese and eventually Lionel Murphy. In 1986 she was appointed to the High Court bench newly headed by Chief Justice Anthony Mason. She served on the bench, during the Howard years, and resigned in February 2003, a decade ahead of the compulsory retirement age. At the book’s close she was living in the Loire Valley with her second husband, but still involved in the law, but now at an international level. She commenced a part-time appointment to the International Labour Organisation’s Administrative Tribunal in 2003, and in 2006 was appointed to the ‘Redesign Panel’ appointed by then UN Secretary-General Kofi Annan. 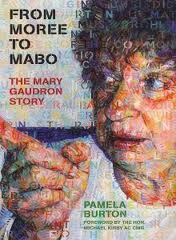 The book closes, as it started, with the personal: the painting of the portraits of Mary Gaudron, one of which graces the cover of the book. A biography is not just a chronicle of events: there are other threads that need to be woven and drawn through the narrative. One of these, unsurprisingly, is gender. It’s appalling to read the newspaper response to her appointment to the Arbitration Commission in 1974: “New Justice interrupted by baby’s cry” and “The law and the laundry- Youngest judge has no time for ironing”. I found myself angered, and saddened, by the reversion to an all-male bench when she retired, although the Howard government did later appoint two women (Susan Crennan in 2005 and Susan Kiefel in 2007). Gaudron’s own take on equality- or rather, inequality – is interesting: “the different treatment of persons who are equal and the equal treatment of persons who are different” (cited p. 301). Another thread is politics. There is no pretense that Gaudron is not a ‘Labor lawyer’ both by inclination and in terms of her own career stepping stones. Particularly during her time as Solicitor General in NSW during the 1980s, she was accused of being in the pocket of the Labor government, but as Burton takes pains to explain, Gaudron’s arguments about the use of illegally taped evidence centred on the law, not politics, even though political arguments were drawn from her opinions. The point is made several times that, in terms of the intersection of politics and law, it does matter who is sitting on the High Court bench. On the other hand though, the composition of the bench and the tendency of the judges sitting on it, does not necessarily reflect a strict Liberal/ALP division. Chief Justice Mason and J.Deane were coalition appointees, yet they formed part of the 6:1 majority in Mabo. Gaudron’s own judicial reasoning as an intellectual exercise is the third theme, and it is explored repeatedly through its many different manifestations through the book. While noting the exercise of Guadron’s judicial logic in crafting her judgments, the book also emphasizes the fact that a judge is part of a bench as a group. This is not an authorized biography. Gaudron was not interviewed for it, and she did not allow access to her personal papers. Much of it is drawn from interviews and biographies of other judges, newspaper article, and the law reports that emerged from the cases on which she sat. Despite the title, her work as High Court judge takes up perhaps 100 pages of this 370 page book. Perhaps it was just me, but I found the chapters on her time as Solicitor-General of NSW as the most difficult to follow. I had only a vague recollection of those events that are now 20 years in the past, and I felt as if the author was assuming a familiarity with them that I (as a Victorian perhaps?) just didn’t have. On the other hand, Burton’s explanations of significant court cases that occurred more recently but with less notoriety, were fuller and gave sufficient background for the reader to understand the argument that Gaudron was making and the significance of the case. Nonetheless, as a reader you need to meet this book half-way. Johnson: Well, your Honour, if it is of assistance, the practice in the Federal Court…has been to call the applicant by the assigned name. Guadron, J.: The assigned name? Johnson: Well, there is an assigned, I think probably randomly allocated, set of letters in the Federal Court. …. You repeat that it is valid and that I am to treat this person as if he had no name. Do you assert that? I am to sufficiently ignore the man’s humanity as to deny him a name in these court proceedings and to deny him the ordinary courtesies that I would extend to anyone at the Bar table? … Well, it is not. I would not do it. I would not do it because it is discourteous. I think that interchange this in many ways encapsulates the intersection of judicial personality and intellect that Burton explores in this book. A good biography’s effect on the reader should extend beyond the last page, and this is very good biography. The Mabo decision still reverberates, but it is asylum-seeker policy right now that the sharp end of policy and the courts come together- and will do so even more should the Coalition win the next election as everyone expects. Although Gaudron is no longer on the High Court, I sense that it is in asylum-seeker policy that her contribution is likely to be ongoing. Thanks to this book, I will read the further judicial contributions to asylum-seeker policy with new eyes and new interest. Read because: I have reviewed this as part of the Australian Women Writers Challenge. Although it is set 170 odd years after my own research, I was interested in reading a judicial biography about a woman, written by a woman. My thoughts about judicial biography as a genre can be found here. 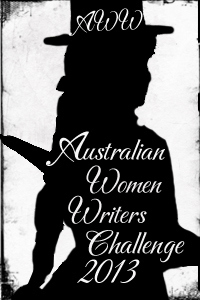 This entry was posted in Australian Women Writers Challenge 2013, Biography, Book reviews. Bookmark the permalink. I remember her although nothing about her. She seems to have been a judge who like plain and clear speaking, and dismissed the obvious and blatant word play. I was aware of her from the Mabo case, and knew that she was the first woman judge on the High Court. I’m glad that the photos were included in the book because I had no visual impression of her at all.